If there’s one thing we’ve learned about search engine optimization, it’s that you can never rest on your laurels. What once worked like a charm to keep your website ranked and highly trafficked no longer does. Many of us have learned this the hard way. What SEO strategies do we anticipate working in 2018? The things I outline below. Google is constantly updating their algorithms and we need to update our priorities and our websites to keep up with them in order to keep our organic rankings high. 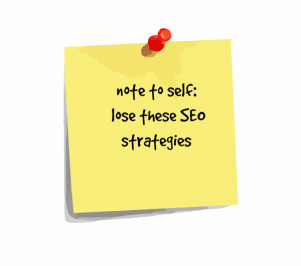 This is part 1 of 2 posts geared towards organic seo strategies to incorporate into your website updates. One of the first things people ask me when creating a marketing plan for their new business and website is how to get those backlinks I keep talking about. Back in the day, the amount of backlinks a website had had a direct relationship with rankings and website visibility. With the new( ish) Google updates over the past few years, Panda and Penguin, that ship has sailed. Google no longer looks for quantity of backlinks, rather, in their quest to up the quality of search results, they look instead for quality backlinks. Relevant backlinks that have to do with your brand, your services, your audience. Example: 5 years ago, the SEO company JC Penny was using got canned for the black hat tactics of backlinking to every site they could get their hot little hands on, despite the fact that there was no relevancy whatsoever to JC Penny’s products. Not only was the SEO company given the boot, JC Penny’s bottom line suffered for quite some time because of the trickle down effect. Note to selves: make sure your backlink building strategy is honest and relevant and makes sense. No one will ever buy that Taiwanese chopsticks Inc. is really interested in commenting on your car repair blog. 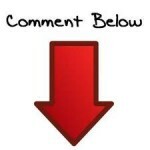 Comment, and send your content to high authority blogs and websites, and make common sense relationships with them. This is what Google looks for these days and will reward you for. Quality, not quantity. In keeping with the quality vs. quantity theme, be advised that the same Google algorithm change talked about above, Panda, targeted, and pinged sites with low quality content. Such sites got penalized, and their search traffic dropped. It had nothing to do with how much content was there but rather the quality content, which you can read more about here. Rather than making yourself crazy creating more more more, concentrate instead on the type of content your ideal client will click into and respond to. Often times these days this is video, or audio, which has limited amounts of copy. That’s not to say that along with this content you shouldn’t be adding accompanying keyword rich text, whether it is in the form of a transcript, or long-tailed keyword phrases. And of course, if your ideal audience responds to images, which so many do, remember to include alt text, or the search engines won’t be able to find it at all. One of the top complaints that I hear from harried business owners is the idea that they have to be everywhere, doing everything, implementing all the newest bells and whistles as they emerge, or they will be left behind in the game, and that their SEO will suffer. Note to selves: This can’t be further from the truth. Although there are some basic social platforms that you can’t ignore these days (yes, you must have a website if you want to be taken seriously. Really- stop asking that question) it is your job as a business owner to have done your homework, taken your surveys, watched and paid attention to your analytics, and from this your answers will come. So yes, at first you will need to test many social media platforms to get a good scope of the analytics, but as your audience slowly becomes defined, and you begin to see what is bringing them into your site, and where they are, what is making them click, where they are coming from offsite, you will begin to narrow your platforms and maximize the chosen ones. Point of fact: if your services are catering to a 65+ age group- say you are an elder care masseuse, Twitter may not be your social media platform of choice. You finally made it to the top of page 1 of Google! Congratulations! But alas…your phone is not ringing, your contact page sits dejected and lonely, and your website is not a-buzz with traffic. What’s the deal? Just because you are finally ranking high for your keywords does not necessarily mean your click through rate is high as well. Why? Could be a few reasons but chances are the biggest one is that there isn’t a lot of search volume for the keywords you are targeting. So just as it is important as defining your ideal client is targeting what terms your ideal client is putting into their browser bar to find you. I’m going to save you some pain, because I don’t know if you’ve noticed, but these days that is hard to find from your Google Analytics unless you dig further. Unless you are paying for Google Adwords, Google no longer shows your top search queries and keywords. Bummer, and it pisses me off to no end, but that is the way it is. 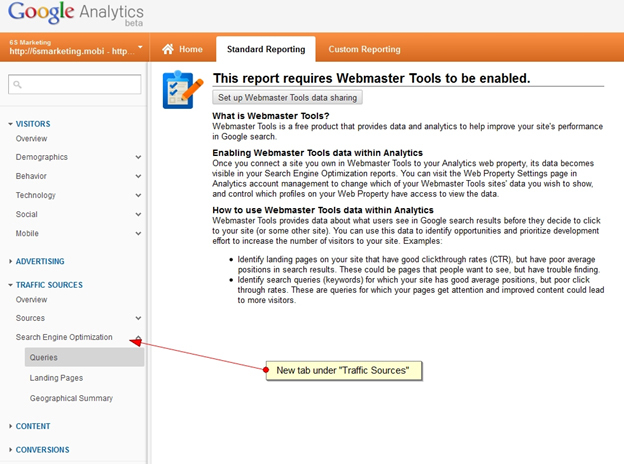 log into your Google Analytics account and click on your website URL to view your report. Go through the steps of enabling your webmaster tools and you will now be privy to a plethora, and by a plethora, I mean more than you ever want to know but much that is juicy helpful data that will enrich your content and SEO efforts to create traffic, rather than just rankings. For these purposes, look for these things first: Queries, and Landing Pages. In queries, you will see in descending order, the keywords you are ranking for, the click through rate, the impressions. Click through rate is key here, no pun intended. The higher the click trough rate the more relevant the keyword. This info gives you what you need to make informed decisions when crafting your content, as it tells you what your clients are looking for. Your low hanging fruit. Now you can be targeted, and increase your traffic by speaking to your clients with the knowledge of what interests them, rather than what interests you. Next look at Landing Pages. It also ranks most clicked pages at the top and descends from there. What are your clients going for when they come to your site? Be cognizant of that when crafting your pages. Relevance. Targeted. Back in the day, this was the case. Life was so easy back then. Note to selves: Now that Google has grown up it has become much more sensitive to the user experience, it not only encourages, but will ping you ( not in an ooooow that felt good way) for peppering your blog post with your most highly optimized search term. It’s all about the user now, and the quality of the content. So do not write for the search engines. Rather, with your highly trained SEO skills, write for your audience, with an eye towards the search engines. In other words, mix it up. Use variety. Where in one paragraph you discuss the keyword you’re targeting: video blogging, in the next, use the term vlogging ( once you’ve described it). Be creative so that you can keep your audience engaged and reading, while keeping Google happy by knowing what you’re talking about. It is never too late to make changes to your SEO strategies. The only static thing about SEO is that it is always changing, (get that?) If we want to increase our website traffic, and stay ahead of the game by keeping our blogs, vlogs and websites ranked, these 5 strategies are easily implemented, and important. Search engine optimization does not need to be complicated!